Why is Volkswagen Called Volkswagen? The Volkswagen brand has gone through a number of iconic iterations since its launch in the late 1930s. There was the original Type 1 Beetle that became symbolic of West German restoration in the wake of World War II. There was the hippy Volkswagen van and flower power Beetle that was emblematic of the American 1960s counter-culture era. Recently, Volkswagen experienced a PR nightmare and were running on empty due to an emissions scandal, but in the twenty-first century, the Volkswagen brand is synonymous with efficiency, reliability and urban sophistication. Volkswagen’s name and history has a pretty dark and controversial past. Looking at the brand these days, you’d never imagine that the original Volkswagen model was conceived by Adolf Hitler and was part of a broader government roads plan. The company was originally run by the German Labour Front, which was the labor organization of the National Socialist Party—aka, the Nazis. The German government, under the rule of Hitler, created the Deutschen Volkswagens mbH in 1937, which was later shortened to Volkswagenwerk. Why is it Called Volkswagen? The first Volkswagen designer was Ferdinand Porsche, founder of the Porsche car corporation, who was hired directly by Hitler and given the task of creating an affordable and dependable family car for the German people. Quite simply, that’s what Volkswagen name means, “the people’s car.” Porsche, who also designed the Mercedes-Benz SS and the first gasoline-electric hybrid car, created the Volkswagen Beetle in 1938, though it wasn’t mass-produced until 1945 because of the destruction of the original Volkswagen plant during World War II. The original Beetle was called the KdF-Wagen, or the Kraft-durh-Freude-wagen. In English, the Strength-Through-Joy car. 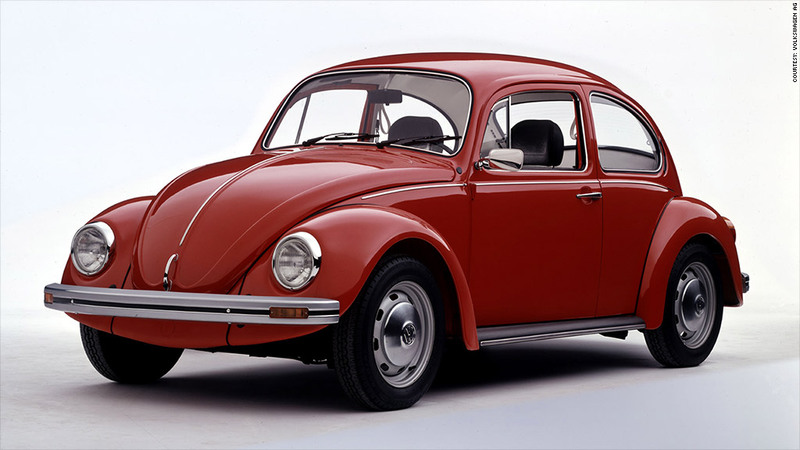 It wasn’t until the late 1950s that the car was renamed the Beetle by the Doyle Dane Bernbach ad agency, who sought to boost American sales, which were pretty dismal in the midcentury due to the car’s relationship with the Nazi party and Hitler. This ad campaign, which centered around the risky slogan “Think small,” was tremendously successful and produced some of the most innovative advertisements of the twentieth century. 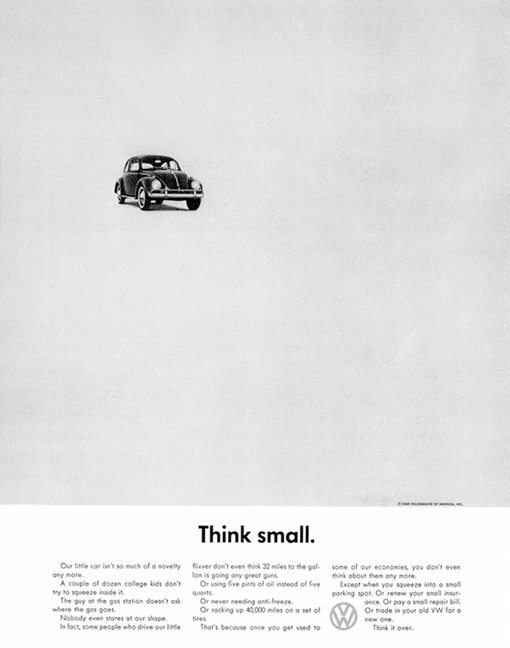 In the ads, the Beetle, which was around the size of a half-dollar, was placed against a completely white background with the “Think small” slogan printed in bold letters at the bottom. The Beetle, or “Bug,” as it soon affectionately became called, quickly became the best-selling foreign car in the American market and as of today, holds the esteemed position of the most-manufactured car in the world. SEE ALSO: Why is Mazda Called Mazda? The “people’s car” has a long and contentious history that travels through some of the most well-known historical events of the twentieth century. There are probably fewer cars that are more globally loved than the Volkswagen Beetle, but its connection to World War II and one of the greatest tragedies of modern times cannot be denied. Though the company has been embroiled in a bit of controversy during the last couple of years, it will be interesting to see if they can once again reach the heights of their legendary and iconic status. Travis McDonald is a professional freelance writer who creates content for a wide variety of clients. He received his bachelor’s in English from The University of Texas at Austin and his MFA in creative writing from Virginia Tech.